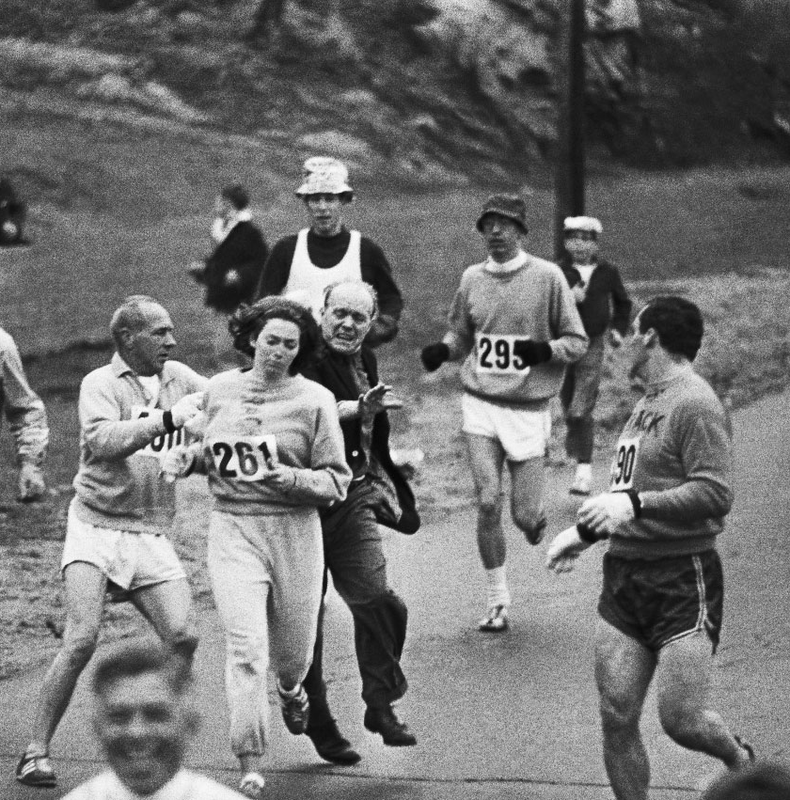 Women were not allowed to officially register for the Boston Marathon until the Fall of 1971 for the following year’s race. Before that, women had competed, but it did not go over well. In 1966, Roberta Gibb was the first women to compete; however it was not permitted or recognized any of the three years (1966-1968). She actually hid in the bushes until the start of the race to go unnoticed. 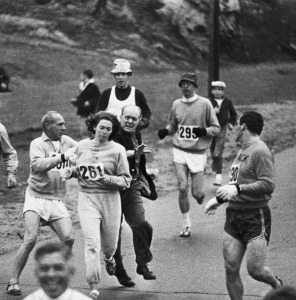 In 1967, Katherine Switzer was the first women to run and complete the race with a bib. She applied for the bib using her initials and last name so she was initially undetected by the race committee. According to her account, she simply signed her name the way she always had; with no intention of making history or being a martyr for future women racers. 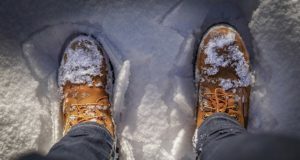 When it was discovered she was competing, race officials attempted to physically remove her from the course; however they were unsuccessful and she finished the race. Her full side of the story is quite fascinating and can be read here. The first year women were allowed to register, eight women ran the 1972 race and all eight finished. The first official woman champion is Nina Kuscsik. It’s crazy to think that women were not allowed to compete until 43 years ago; especially since so many of them do now! Last year, Shalane Flanagan, a women, was arguably the most watched runner since she’s a Boston native and had come in 2nd place in the New York Marathon and won a Bronze in the 2008 Olympics. Though she ultimately came in 6th, she led the way for more than half the course. She can thank the Roberta Gibbs and Katherine Switzers of the world for her opportunity to even compete. We wish all the runners the best of luck and will be cheering you all on come April 20th!